The GSAT-31 is a high power communication satellite which is going to replace another communication satellite that is due to expire soon. 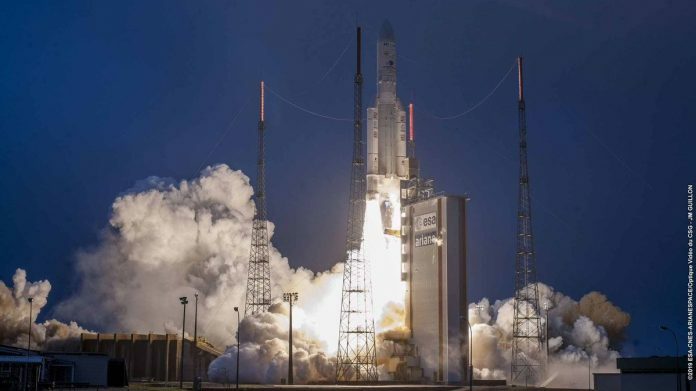 Bengaluru: India’s latest communication satellite GSAT-31 was successfully launched by European launch services provider- Arianespace’s rocket from French Guiana in the early hours of Wednesday. “It gives me great pleasure on the successful launch of GSAT-31 spacecraft on board Ariane-5,” Indian Space Research Organisation’s (ISRO) Satish Dhawan Space Centre (SDSC) Director S Pandian said at Kourou soon after the launch. “Congratulation to Arianespace on the successful launch and precise injection of satellite into the orbit,” he added. The GSAT-31 is a “high power” communication satellite with Ku-band, and it is going to serve and replace some of the satellites that are going to expire soon, he said further. The Ariane-5 vehicle (Flight VA247) also carried Saudi Geostationary Satellite 1/Hellas Sat 4 along with GSAT-31. GSAT-31 separated from the Ariane-5 in an elliptical Geosynchronous Transfer Orbit with a perigee (nearest point to Earth) of 250 km and an apogee (farthest point to Earth) of 35,850 km, inclined at an angle of 3.0 degree to the equator, ISRO said in a release after the launch. After separation from Ariane-5, the two solar arrays of GSAT-31 were automatically deployed in quick succession and ISRO’s Master Control Facility at Hassan in Karnataka took over the command and control of GSAT-31 and found its health parameters normal, it said. During the final stages of its orbit raising operations, the antenna reflector of GSAT-31 will be deployed, and following this, the satellite will be put in its final orbital configuration, the space agency said, adding that the satellite will be operational after the successful completion of all in-orbit tests. Weighing about 2,536 kg, the Indian satellite, GSAT-31, will provide continuity to operational services on some of the in-orbit satellites. “GSAT-31 has a unique configuration of providing flexible frequency segments and flexible coverage,” ISRO chairman K Sivan said. “GSAT-31 will provide DTH Television Services, connectivity to VSATs for ATM, Stock-exchange, Digital Satellite News Gathering (DSNG) and e-governance applications. The satellite will also be used for bulk data transfer for a host of emerging telecommunication applications,” he said in a release. Riding in Ariane-5’s upper position, HS-4/SGS-1 was released first in the flight sequence, with its separation occurring about 27 minutes after liftoff. HS- 4/SGS-1 will provide telecommunication capabilities, including television, Internet, telephone and secure communications in the Middle East, South Africa and Europe, Arianespace said on its website. GSAT-30 is another geostationary satellite to be lofted soon by Arianespace for ISRO.